Dental problems in dogs and cats are more common than we think. Despite the fact that about 98% of vets recommend dog owners to clean their teeth, only about 2% actually apply this advice. In addition, research has shown that 80% of dogs older than three years have dental problems, while only 23% of dog owners indicate that their four-legged friend has a dental problem. To raise national awareness for this problem, February has been declared National Pet Dental Health Month. Dental problems in dogs are often caused by plaque and tartar, in addition to trauma (e.g. tooth breaking). Plaque (also called dental plaque) is a barely visible layer that forms continuously on the teeth. It consists of food debris, mucus and bacteria. When it is not removed, plaque calcifies to tartar. You can help remove plaque yourself; tartar can only be removed by your vet. Anyone who has ever seen or smelled a dog with dental problems will know how important it is to take good care of a dog's teeth. If the dog's teeth are neglected, the animal may even lose teeth. Much worse, your dog's health is endangered by dental problems. Complaints can range from bad breath to tooth loss or even inflammation in important organs such as heart, kidneys and liver - with all the consequences that entails. It is a common misunderstanding that a dog with a bad breath is normal. If a dog's breath stinks persistently, then this can be a sign that there is a dental problem. The diet and the physical condition of dogs has changed over time and can no longer be compared to the living conditions of wild dogs. It is therefore important to take care of your pet's teeth daily and have them checked regularly. The care of the dog's teeth is easy to do yourself (dental care in cats is generally more difficult). You can take care of your dog's teeth in different ways, depending of course on what your pet allows. As with humans, your dog's dental care consists of cleaning teeth by brushing them. In addition, there are various products that support the care of the oral cavity and gums. Besides brushing the teeth, you can also use toothpaste powder such as Orozyme Bucco-Fresh PlaqueOff or Proden PlaqueOff. These are powders that need to be sprinkled over the food. There are also liquids, such as Orozyme RF2 Aquadyl and Vet Aquadent available, which you can mix in your dog's drinking water. In addition, almost every commercial pet food brand has a special toothpaste that also helps to clean your dog's or cat's teeth. 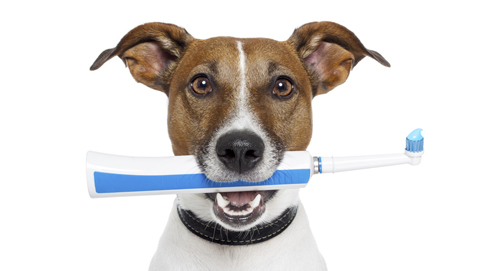 For brushing your dog's teeth, use toothbrushes and toothpaste specially developed for dogs. A unique and properly designed dog toothbrush is the Petosan Toothbrush. Usually dog toothpaste has an attractive meaty taste, which means that dogs are not likely to reject instantly. A recommended toothpaste for dogs and cats is Virbac Toothpaste. If possible, start brushing your dog's teeth early, preferably when a puppy is between 8 and 12 weeks old. If you start later, the dog will need more time to get used to getting its teeth brushed. Some animals may never even get used to it again. When you clean your dog's teeth it is not necessary to fully open your dog's mouth. In most cases it is sufficient to lift the lip and then clean all visible parts on the outside of the teeth. Also, the chewing surfaces and the inside of the teeth should not be forgotten. A number of teeth and molars from the upper jaw rub clean parts of teeth and molars in the lower jaw. The more often you brush, the faster your dog gets used to it. Of course, this is also better for a healthy dental health in the long term. To prevent tartar, however, you do not need to brush more than once or twice a week. If you have trouble brushing your dog's teeth, you can contact your vet for a clear explanation and help. Brushing is the best way to clean your dog's teeth. If your dog does not allow for you to do this comfortably, you can consider one of the other methods. It works best to use multiple methods interchangeably. Complement weekly tooth brushing with one of the previously mentioned products. Tasty chips to maintain healthy teeth. For the care of dogs' teeth. Dog chews to help clean teeth and freshen breath. Help clean your dog's teeth. Tasty toothpaste designed for cats and dogs. Against plaque and bad breath. Add to drinking water to reduce adhesion of bacteria to teeth.